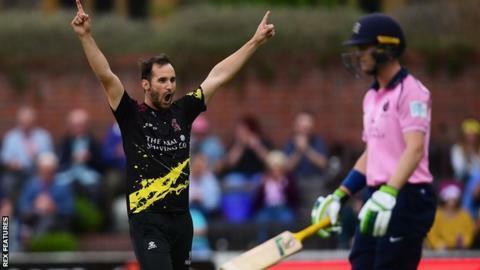 Somerset beat Middlesex on a rain-hit day in the T20 Blast as Lewis Gregory hit 62 and then took four wickets. Half-centuries from Peter Trego (60 from 31 balls) and Gregory (62 from 26) helped the hosts win by 38 runs (DLS). Sunday's action was otherwise spoiled by wet weather, with three of the four scheduled fixtures being abandoned. No balls were bowled at Sussex's match at home to Hampshire, Kent Spitfires' trip to Glamorgan or Lancashire Lightning's visit to Worcestershire. Somerset's victory lifted them up to third in the South Group, while Middlesex stay seventh with just two wins from seven matches. The hosts posted a formidable 229-6 from their regulation 20 overs after a delayed start because of rain, and further wet weather than halted the visitors' chase. Middlesex were set a reduced target of 213 from 18 overs following the resumption but Gregory (4-28) helped limit their run rate, despite Stevie Eskinazi's 55 from 32 deliveries.